What do you do with a collection of vintage treasures? You find ways to display them! One great area to set up a display is on the fireplace mantel. Decorating a mantel takes some thought. However, if done right, you’ll create a visual appealing showcase. Before getting started, there are guidelines to follow that ensure a successful mantel design. There has to be a balance to the items displayed. Your biggest pieces or pieces should be at the center of the mantel. These will be the main focal point. Once you have your center picked out, you can start working on the sides. Sometimes only one item works perfectly for a focal point. A large picture or a mirror are popular focal points. 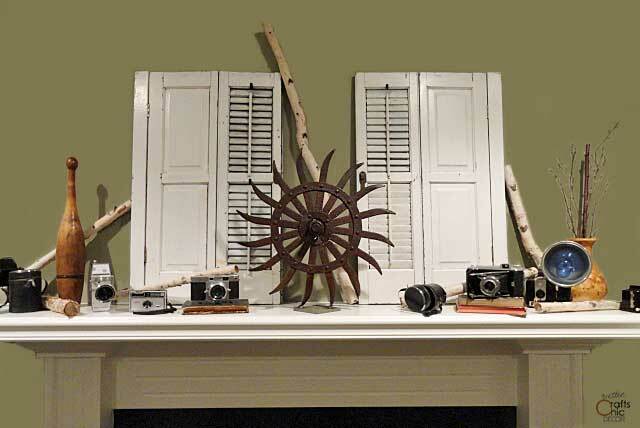 I used a pair of shutters and a salvaged metal piece as my focal point. Because the metal piece is shorter than the shutters, I place a tall birch log behind it. 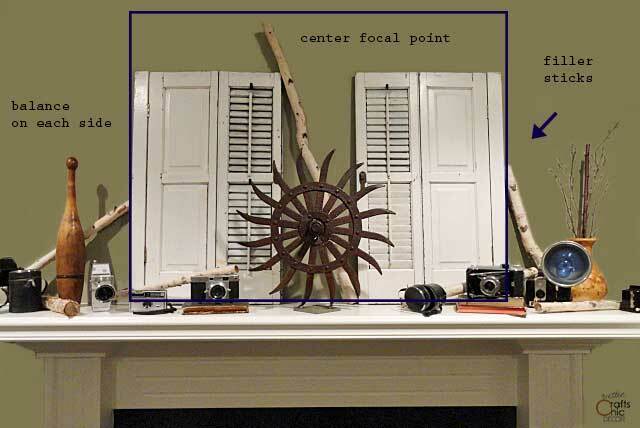 Place medium height and smaller items to the sides of the focal point. It looks nice to have both sides at about the same height and weight. If you have a lot of small items in the same size, simply place some on stacks of books or a case to create a height difference. I used books underneath a couple of the cameras. Once you have everything laid out, check for gaps. Depending on the look you are going for in the room, some empty space is okay. However, when a lot of items are being displayed, you may need fillers to keep a good balance. I used thin birch logs displayed at different levels to keep the balance of the design. 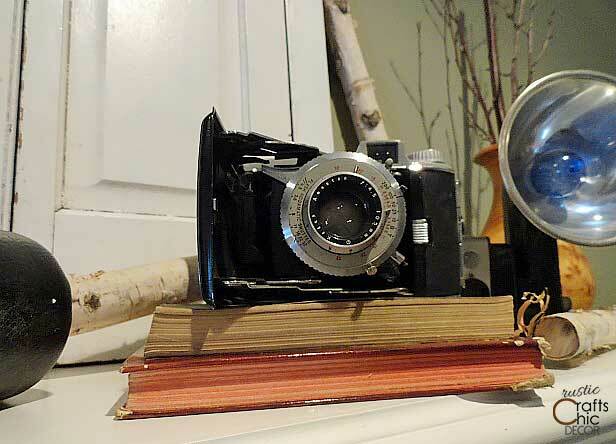 It’s funny but the main purpose of my mantel was to display my vintage camera collection. But, since cameras are so small and would be dwarfed on a big mantel, I added the other vintage pieces. 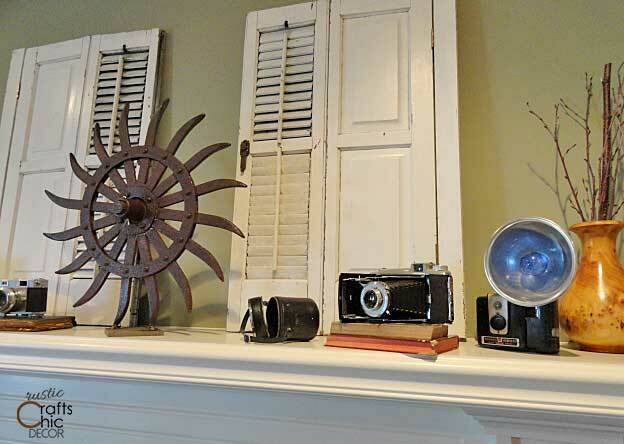 I had a pair of shutters that I had picked up for a smoking deal at an antique store this past summer. They were just waiting for me to come up with a plan. With the mantel all clear and me needing something large for a focal point, the shutters practically came running to me. LOVE the mixed look of your mantel. Wayyy cool stuffies! Thanks Tee, it was fun pulling everything together! Gorgious! Thank yoy for sharing it. You mantle is beautiful and I love all the different elements you used. Lovely! Thank you Ana and Vanessa!